Sweet Home 3D 4.1 was released on June 3, 2013 with a few improvements and bug fixes described in version history. In a recent version, Java changed the way pages were printed and this could cause an incorrect printing where the 3D view was missing and replaced by other pages. The version 4.1 fixed this issue. Some users reported also that the paper margins customization set in the Page format dialog box wasn't taken into account, especially for small values. This looks like a bug in Java and to avoid them waiting for a bug fix during a too long time, I added the new com.eteks.sweethome3d.swing.fixedPrintMargin system property that will let you force the paper margin (expressed in centimeters) that should be used at printing time. This property can be set at program launch using the -D Java option, for example ‑Dcom.eteks.sweethome3d.swing.fixedPrintMargin=0.2 will force the margin to 0.2 cm. With Windows installer version, this property can be set in a SweetHome3D.l4j.ini file placed in the installation folder of Sweet Home 3D. As the Mac OS X full screen mode is now available in Java too, I added support for this nice feature that you'll recognize from its double arrow icon shown at top right of a Sweet Home 3D window. Like many programs, Sweet Home 3D creates some temporary files for various technical reasons. You shouldn't have to care about this, unless these files actually take too much disk space, and moreover if some of them aren't automatically deleted when they are not needed anymore. From its first version, Sweet Home 3D had problems under Windows with the deletion of some temporary files, because of a bug in Java. Even if Oracle didn't fix this bug yet, I succeeded to apply in Sweet Home 3D the workaround they proposed, and this is probably the main reason why you should upgrade to version 4.1, whether you use the installer version, the Java Web Start version, the portable version or the Jar executable version. Note that if you want to clean up the temporary files created in the previous versions of Sweet Home 3D, quit the program and delete the folder C:\Users\user\AppData\Roaming\eTeks\Sweet Home 3D\work if your system is Windows Vista / 7 / 8, or C:\Documents and Settings\user\Application Data\eTeks\Sweet Home 3D\work if your system is Windows XP (user being your Windows login). As computers get more and more powerful, many users create larger and larger arrangements in Sweet Home 3D. This is not a problem as long you're not bothered by the performances loss you'll get inevitably at a moment. But this becomes more annoying if you can't use some features of the program like the photo creation tool, when it doesn't have enough memory at disposal. Even if you have a lot more of RAM on your computer, a Java program like Sweet Home 3D won't try to use as much memory as possible and will limit itself to a maximum set at program start with the Java -Xmx parameter followed by a the maximum memory amount that the program will be allowed to use. As the programer of Sweet Home 3D, one of my main goal is to make the program as simple as possible for you, and I'd prefer not to bother you with that kind of technical detail. That's why I tried to find in this release the smallest maximum memory amount Java would accept to launch Sweet Home 3D, whatever the amout of RAM is installed in your computer. Under Windows, this maximum was set to 512 MB until now, but after running more tests, I experienced that the program could successfully run if this maximum was increased to 640 MB (even if your computer has only 256 MB of RAM), and I found also a way to make this maximum automatically grow up to 1024 MB if your computer has a lot of RAM. This adjustment should give enough room to most users to let them run the program without the need to worry about the -Xmx parameter. In Sweet Home 3D case, choosing Block prevented the browser from checking if you saved your work before leaving the web page. Anyway, I fixed this issue following Oracle instructions and this dialog box won't appear anymore. As a conclusion, even if this release doesn't bring any major new features, I hope that you'll appreciate my continuous effort to make Sweet Home 3D as efficient as possible and that you'll keep having fun with this application. Thanks for the effort keeping actively this great software. Emmanuel, thanks a lot for this great piece of software. I assume it has helped many design their interiors like it did help me. This is really useful and convenient. I am runing OSX V10.8.4 on an Intel 27" iMac. I have been using Sweet Home for years. After installing 3D 4.1, the program loads, brings up a blank page, then freezes. The files that I have been working on shows up in Recents, however they do not load. Any ideas? It's an issue in the last Java update released by Apple. Please read this thread in the forum to help you fix it. I have to say thank you to everyone involved in making Sweet Home 3D 4.1, I design daily with Autocad and I have to say that Sweet is one of the best open source cad applications that I have ever had the pleasure of using. Again Thanks for such a great little application! 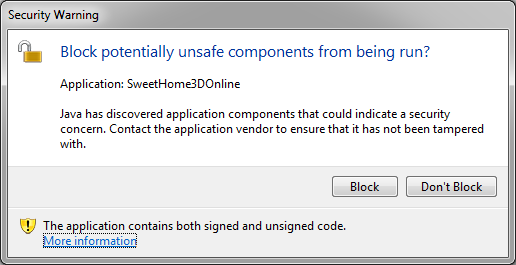 How do I Uninstall Sweet Home 3D with Java Web Start? The most reliable way is to remove it from Application Cache Viewer.